Richard Bell approached us almost two years ago asking if we could help bring back from the depths of local history a Victorian marvel that had been lost. Richard is a direct descendent of a man called Henry Senior who was responsible for a truly magical place that was a house and cloisters carved entirely out of sand stone in a quarry around the 1850’s onwards. It became known as the Sand House and had solid stone walls that were millions of years old; sculptors came from the local area to make contemporary sculptures that reflected the Victorian Imperial era. The Sand House became renowned in the area for its parties, it had a ballroom that could accommodate 200 people and I even met an elderly lady a few days ago that related how her Grandmother used to enjoy going there for Tea Dances. One of the most notable sculptures made was an Elephant and Mahout made around 1860, indicative of Britain’s relationship with India at the time. Once Henry passed away, the house was bequeathed to the council and after some time ran into disrepair. 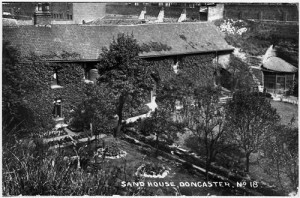 In the 1930’s the council made an order to use the site for landfill, the Sand House and the Cloisters became buried and disappeared into history. The legend of the Sand House was fuelled in the 1950’s as there was talk of some children playing in tunnels where there were sculptures of King and Queens, Elephants and Clowns. In the 1960’s, 70’s and 80’s there was a glimmer of hope as the Sand House was rediscovered due to construction that took place above, however the result was to stabilise the tunnels by filling them in with concrete. The Sand House was lost. In the true spirit of Henry Senior, Richard Bell who is his Great, Great, Grandson did not accept this. Just before the tunnels were finally filled in he went into them to see what his ancestor had made. 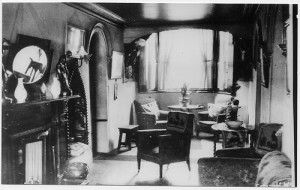 Richard became so inspired that he decided to rekindle the Sand House in peoples imaginations by writing a book supported by photographs of the time. 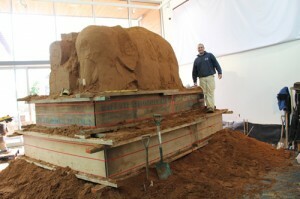 After great success he then approached us and asked if we would make one of the sculptures to scale that was in the house in sand. We decided to make the Elephant and the Mahout. Richard then spent over a year securing funding with Arts Council England and organising the event, and I am pleased to say that he was successful in bringing the magic back. We spent two days heaving 40 tonnes of sand into an indoor exhibition space making sure we did not damage the lip in the doorway with the forklift truck. I then embarked on making the Elephant and the Mahout. This is a relatively simple sculpture that I found quite difficult as I had to fight my intuition and replicate what I saw on the few old photographs, embracing bendy arms and an impression of what an Elephant was rather than an actual Elephant. You see, it is unlikely that the original sculptor of the 1860’s ever actually saw a real elephant and that perhaps he was working from a publication or drawing. Still, the result is a very impressive and charming sculpture that represents a marvellous period in history. 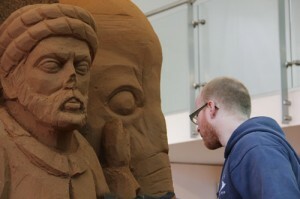 So after 10 days there now stands in The Point Gallery Doncaster a 35 tonne Elephant and Mahout replica of the sculpture as it stood 100 years ago according to photographs, even with the Mahout’s broken nose. When I was carving the sculpture an elderly man came in to deliver some wood and looked up a little stricken. “’Av seen that before!” I looked down at him knowing that the site was filled in in around 1930. In addition to this Sand In Your Eye also conducted a five day course in making sand sculptures for five artists from across the nation. 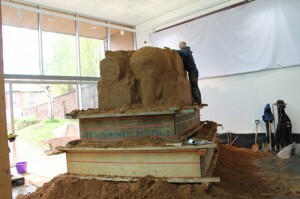 Each artist as a result made a sand sculpture to stand along side the Elephant and Mahout and were able to explore the concepts associated with the Sand House as well as develop their skills in sculpture. A week later we then taught three days of workshops to local children to educate them in the story of the Sand House and to pass on a few sandy skills! The exhibition runs until 29th June 2012. The Point gallery staff for looking after us and being so understanding about having sand everywhere! hi Jamie.. wow.. great work.. it really turned out well.. and so cool that you encountered people who had seen the original.. your story about the challenges of copying the mistakes on the elephant, reminded me of doing a camel based on a painting by Giotto, who, I also suspect had never seen a real one.. have a great summer. There was no images of the side of this elephant, so I had to marry up the image from the front to a true elephant. n the end I had to simplify the true elephant so that it would make sense. Very tricky!